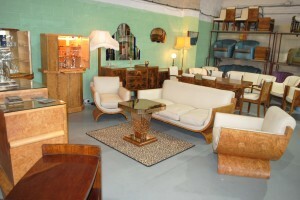 A World of Art Deco Furniture - All Under One Roof! WOW! What an eye opener this is. Wherever possible customers are encouraged to visit us, not only to see our wonderful and huge amount of stock but also to see work in progress in our workshop. Donna, Gordon and Dad Terry will make you most welcome in the showroom and warehouse and will happily take you through the process of repolishing and reupholstery in our workshop. 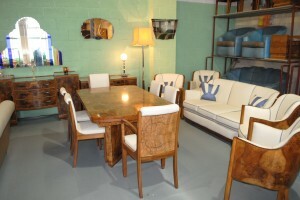 We are sure that you will agree when you see it all for yourself that the setup of Cloud 9 Art Deco is a fairly unique family business. 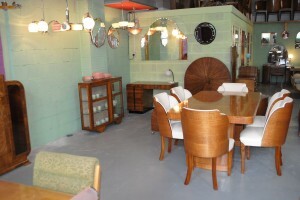 The 4000 square foot showroom has often been described as a home from home. Art Deco that is! Our current stock, can also be viewed at www.cloud9artdeco.co.uk as well as visiting the warehouse, showroom and workshop at unit 12 Douglas Mill, Bradley Lane Standish, Wigan Lancashire. WN6 0XF. Tel: 01257 473688. 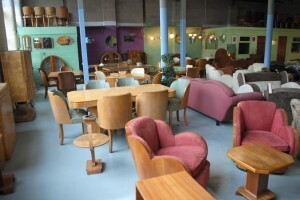 Always a vast amount of original Art Deco furniture, seating stock and Decorative pieces. Here are a few more snap shots from our showroom, obviously the stock you can see is changing all of the time! Our customers enjoy browsing the fabulous shapes and designs of 3 piece suites, occasional chairs and chaises etc, imagining them in an individually chosen colour and seeing the examples of other fabulous pieces already done in our showroom. The highest quality and standards speak for themselves! Come and visit us to see this unique experience for yourself. Workshop Where is all takes place ………. 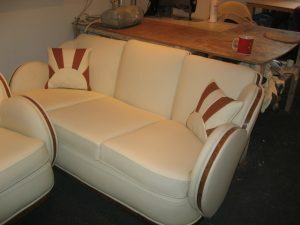 A 3 piece suite just off the work bench.